Quentin Tarantino is, without a doubt, one of the biggest movie nerds in Hollywood. His movies are loaded with homages and references to movies from around the world, from the famous to the obscure. And I'd be willing to bet that he's probably forgotten about more movies than most people have actually seen. But while he may be a faithful student of cinema as a whole, Tarantino is a quite vocal fan of old exploitation movies. And it was because of this affection that he teamed up with fellow director Robert Rodriguez to create Grindhouse. A pair of pseudo-exploitation movies directed by Tarantino and Rodriguez and released theatrically in the United States as a double feature, Grindhouse wasn't exactly a box office success. Frankly, it was a big fat bomb. In an apparent attempt to recoup some of their losses, Dimension Films and the Weinstein Company separated the two halves  Rodriguez's Planet Terror and Tarantino's Death Proof  and gave them individual releases when they landed on DVD. Though I loved Rodriguez's contribution, Tarantino's half left me disappointed. Why? Because Death Proof is a long-winded, self-indulgent snoozefest that, in spite of a handful of great elements and moments, is really just one big sour note. "Jungle Julia" Lucai (Sydney Tamiia Poitier) is the hottest DJ in all of Austin, Texas. And to celebrate her birthday, Julia and two friends, Arlene (Vanessa Ferlito) and Shanna (Jordan Ladd), are hitting the town. They spend the day and night at a bar, getting drunk out of their minds, rebuffing the advances of some overeager frat boys, and exchanging catty remarks with Pam (Rose McGowan), a childhood rival of Julia's. But what they don't know is that they're all being studied from afar by a guy who identifies himself as Stuntman Mike (Kurt Russell), a scarred Hollywood stunt double. Though he's a bit off-putting, Stuntman Mike charms the four girls, spending the evening flirting with them and having some fun. The night goes on and everyone begins to go their separate ways. Julia, Arlene, and Shanna catch a ride with Julia's pot dealer Lanna Frank (Monica Staggs), while Stuntman Mike offers Pam a ride home. Now this is where the real fun begins. It turns out that Stuntman Mike's customized muscle car is "death proof," allowing him to crash into a brick wall at 100 miles an hour and walk away. Unfortunately for all five girls, surviving only happens if you're in the driver's seat of his car. Before long, Stuntman Mike has killed Pam, then takes out the other four in a violent car crash. Fast forward fourteen months later to Franklin, Tennessee. It is here that we are introduced to a new group of girls: Abernathy (Rosario Dawson), Lee (Mary Elizabeth Winstead), and Kim (Tracie Thoms). With a few days off from the set of a movie they're working on, they decide they're going to have a little fun around town. They pick up a friend, Zoë Bell (playing herself), at the airport, and hit up a local diner. It is here that Zoë informs the others that she's heard about someone selling a 1970 Dodge Challenger in the area. Turns out it's a nearly exact replica of the car from her favorite movie, Vanishing Point, and she wants to test drive it. But once they get behind the wheel, Zoë reveals her true intentions. The truth of the matter is that she didn't want to just test drive the car; she wants to use it to play a dangerous game called "ship's mast," where someone hangs onto the hood of a car while someone else drives it at high speeds. Though skittish about it, her friends agree to play along. Zoë's a trained stuntwoman, what could go wrong? Lots of things, but one in particular. Stuntman Mike has been following the girls, and chooses this moment of vulnerability to strike, chasing them through the hills of Tennessee. But little does Stuntman Mike know that his prey are no ordinary victims, nor does he know just how vicious they will be when they strike back. Death Proof is a shining example of what wasted potential looks like. The movie has some elements that could make it great, but its flaws are too great to overcome. What really grinds my gears about Death Proof is that, prior to it being released theatrically, I kept hearing that it was supposed to be a slasher movie. I don't know what movie the guys taking care of Grindhouse's promotional material were watching, but Death Proof isn't like any slasher movie I've ever seen. It isn't even like any horror movie I've ever seen. Had Tarantino followed the typical slasher movie formula, it might have been a damn good movie. But no, he had to go and ignore the tried and true formula that worked for hundreds of movies during the '80s. The result? Tarantino's made perhaps the worst movie of his career. And that's terrible. Tarantino has never really been the most technically savvy director. He usually has the camera stuck somewhere and lets the actors do their thing. He got a little braver with Kill Bill, and continues that with Death Proof. He even does all the cinematography too, and his work is actually pretty killer. The movie looks really good, with some great camera shots and a real sense of energy during the key scenes. There is one weird thing I picked up, though. Part of Grindhouse's gimmick is the idea that the film prints were going to look damaged, full of blemishes, choppy editing, and general wear and tear. And that's what's in the first half. It's not to the extreme that Planet Terror takes it to, but it's there to an acceptable degree. But once we move to Death Proof's second half, that all changes. Except for two very brief instances, the gimmick all but disappears with no explanation. At least, no explanation that I could find. Why drop the gimmick for no reason halfway through the movie? Even if it served no purpose, at least it could have been kept there for consistency. But while I otherwise liked Tarantino's work as the director, it's his script that really grinds my gears. Seriously, this has to be one of the most poorly-written movies I've ever seen. There's nothing resembling any sort of structure or anything like that. It's like Tarantino just sat down and wrote everything that came to mind, then cobbled it all together and called it a script. There's no development at all, neither with the characters or the plot. It's pitiful. The characters sit around and have conversations that go absolutely nowhere, which goes on for about an hour before Stuntman Mike shows up and attacks them. For all they're worth, Tarantino could have spent two hours filming a sign saying "please go see Vanishing Point and Dirty Mary, Crazy Larry," and it would have accomplished the exact same thing. Seriously, these extensive talking scenes contribute utterly nothing at all to the movie. You think I'm kidding? I'll point to two examples. One is in the first half, where they spend five minutes setting up that Jungle Julia has pulled a prank on Arlene, with the punchline showing up later in the movie. This five-minute scene could have been cut down to two, but at least the punchline helps establish Stuntman Mike as an even creepier weirdo than we already see him as. Heck, the whole first half is just people sitting around talking, not doing anything to push the movie forward whatsoever. It gets worse, though. In the second half, there are two scenes that run a grand total of fifteen minutes, just to establish that Zoë Bell wants to drive a particular car. Fifteen minutes just to set up the car! They could have done this in a ninety-second scene where Zoë shows up in the car and says she rented it at the airport when she got into town. Simple as that! To tell you the truth, the second half just might be worse than the first, because although the characters in the first half are thoroughly unlikable, the characters in the second half are just rotten people in general. Specifically, look at how quickly the girls decide to kill Stuntman Mike. The audience knows he's a serial killer, but do the girls? No, they don't. They just think he's some whacko that tried to run them off the road while they were in the middle of playing an incredibly stupid game. They shoot at him and chase him away, which you'd think would be enough. But do they report him to the police? No, he's got to die! That's a pretty strong reaction to some loony that rammed your car, isn't it? If Tarantino had made a regular slasher movie by having Stuntman Mike pick them off one by one over the course of the movie, then it would have been okay. But for them to randomly decide to murder someone in a fit of road rage simply makes the characters look like really awful people. And it didn't hit me until now, but with some psycho ramming their car at 100 miles an hour with their friend hanging for dear life onto the hood of the car, wouldn't it have been common sense to try and pull over so their friend could get to the relative safety of the vehicle's interior? And then there's the cast, a mixed bag of decent and downright bad performances. Among the first half's featured players, Vanessa Fertillo is the only member of Jungle Julia's posse that I didn't want to smack upside the head, while Rose McGowan hands in a very amiable, charismatic performance. Tarantino also shows up as a bartender and is quite funny, while Eli Roth, who plays a frat boy trying to pick up Jordan Ladd's character, should never act again. Moving on to the second half, Rosario Dawson is the most talented actress amongst the four would-be victims, and her performance is as good as you'd expect from her. I also liked Mary Elizabeth Winstead's sweet performance, though her character drops off the face of the earth after a couple of scenes. And I know I called out Eli Roth's bad performance, but it's nowhere near as bad as Tracie Thoms's. I'm not sure if I've ever seen her in anything else, but after seeing Death Proof, I don't want to. She is horrendously awful, one of the most dreadful performances I've ever had the misfortune of watching. Thoms's performance is repellant from start to finish, which isn't helped by the fact that her dialogue primarily consists of profanities, sexual references, and a particular racial slur. If I never see her in another movie, I'll be set for life. However, all the bad performances make Kurt Russell's performance look even better. Go watch Death Proof, and I'm sure you'll agree that he's absolutely awesome. Though he starts off as just an off-putting weirdo, his transformation into an utter madman  and then into a simpering wuss once he realizes he's not in control  really makes the movie. Russell is, without a doubt, the best part of Death Proof, and is probably the only reason you should watch it. What I'd like to know is how this movie has people defending it. Not just defending it, but saying it's some of Quentin Tarantino's best work! It's one thing to like it, but to actually say that it's a good movie is preposterous. Are the people defending Death Proof just über-devoted Tarantino fans that simply can't admit when he's made a bad movie? I mean, it's perfectly okay for Tarantino to make a bad movie once in a while. It happens to everybody. Take Grindhouse's co-director Robert Rodriguez, for example. From Dusk Till Dawn and Sin City were fantastic, but just because those movies are good doesn't mean that The Adventures of Sharkboy and Lavagirl in 3-D is good too. Does it? 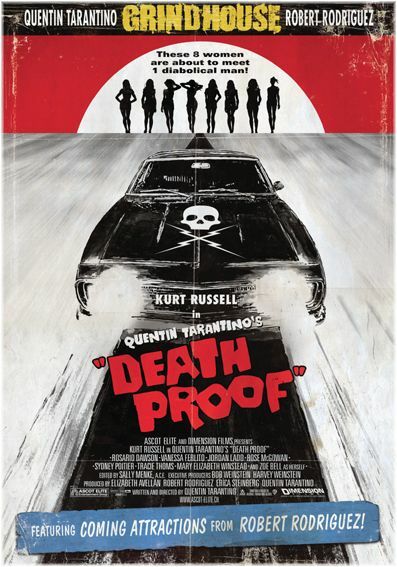 You know, I actually have an idea that could have improved Death Proof, at least in my eyes. There's a scene between the first and second halves where the police figure out that Stuntman Mike is a killer, but can't arrest him on a technicality. What would have been great is if they'd had one rogue cop hunting Stuntman Mike down, kinda like Dennis Hopper's character in Texas Chainsaw Massacre 2. That would have been an awesome second half, but no, that might have made the movie pretty good. Instead, we get this piece of crap. One awesome character and a great car chase just can't save Death Proof from me giving it two and a half stars. What a disappointment.